Firstly, did you see what I did up there, God I crack myself up. So, Jasper and Grover’s pregnancies and subsequent bouts of insanity ended my love-affair with coffee. Or with a skim mocha more appropriately. Coffee now makes my tummy sad and my nerves very very edgy. I am officially a tea drinking through and through. I even make my own blend of loose leaf tea. Because tea aficionados can be just as pretentious as coffee ones. I ‘discovered’ chai along with the rest of the western world and while I appreciate proper chai tea all that milk can make me feel pretty skeevy. When I saw Suse’s post (and far more lovely pictures than my own) about this chai mix I knew I had to give it a go. 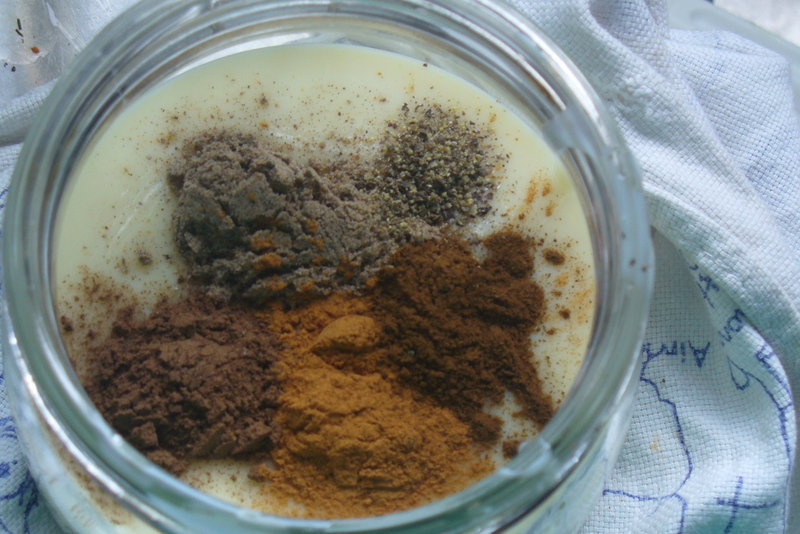 This came from the lovely Suse but I have adjusted it, using skim condensed milk and doubling the spice mix – again I like it sweet but not too sweet and not too milky. I also ramped up the cinnamon content because my level of cinnamon adoration is probably bordering on creepy. Obviously if you like it sweet and milky just halve the spice quantities I outline below. Seriously, this is the best. I keep it in a cute jar in the fridge and every morning have my fancy pants chai tea. It lasts me a week. To use, stir a dessert spoon into a cup of strong black tea.